Rosacea is a benign, often for years lasting inflammatory disease of the facial skin. The cause of rosacea is unknown, occurs in families and at different stages. The cause of rosacea is still unknown. Probably the predisposition is inherited. Triggers can be: sun, heat, cold, stress, skin irritations caused by cosmetics or – in women – be hormonal changes. The coupe rose, (stage I), with its dilated capillaries in the areas of the cheeks, is the mildest form of rosacea. But it is very fine dilated blood vessels in the skin that appear as erythema, especially in light skin type. 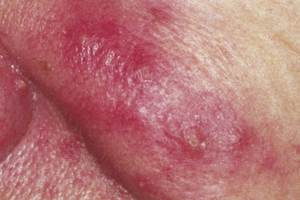 The stage II is the inflammatory type of rosacea, and presents itself as an inflammatory type of acne. It is located mainly on the forehead, nose and cheeks. The most severe form, the stage III is combined with an enlargement of the sebaceous glands. Because they are more numerous in the nose, it may be that this will form a so-called bulbous nose (rhinophyma ). The treatment of rosacea should start as early as possible to stop its progression. Rosacea can be treated according to the stages: cosmetics, delightful poor cleaning and maintenance, internal and external medications, laser and IPL treatments or radiosurgery. In the 1. stage laser treatment of veins, IPL light treatment of extensive facial redness. In the 2. stage (tetracyclines) and external (metronidazole, pimecrolimus) anti-inflammatory therapy. In the 3. stage surgical procedures are often (laser) required. It is a chronic disease of young adulthood and affects almost exclusively women. As causative factors other than a genetic constitution of a number of factors known: cosmetics and oral hygiene products intolerances and allergies, cortisone therapy, hormonal factors, gastrointestinal disorders, intolerance to light, but in particular a gastrointestinal colonization by Candida albicans and psychological factors. The causative triggers must thoroughly investigated and, if possible, stopped. 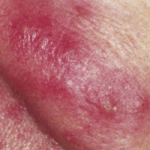 The disease manifests itself in redness, small nodules, pustules and papulovesicles, mainly around the mouth (perioral), but also up to the eyelids up reaching. The disease can have disfiguring proportions if it is not treated properly. Releasing all causative factors. gastrointestinal reconstruction. Less stress, if possible. Omission of all cosmetics. Careful skin cleaning with the prescribed cleaning agents. External and internal therapy with prescribed drugs. Are initially low in fat wet packs and envelopes. Do not apply cortisone ! Conveniently are often stays at the seaside or in the mountains.